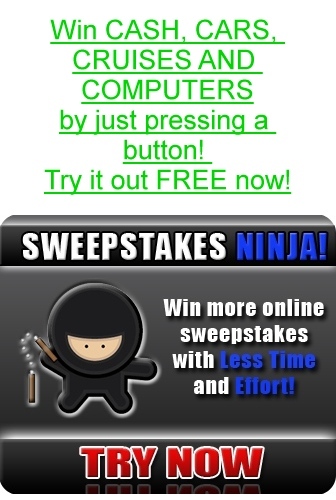 To introduce Evidence Cleaner, we are offering a special promotion! Only $29.99 U.S. for the full version until April 23, 2019! Click here to order now! 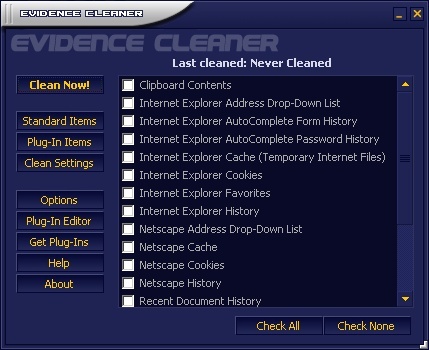 Evidence Cleaner is a very user-friendly application designed to remove all traces of your PC activity, including your surfing habits (cache, history, cookies etc. ), recent documents list, Clipboard contents and Recycle Bin, amongst many others. Practically every application on your PC keeps a record of your activity in the form of a Recent File/Documents list. 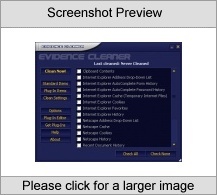 Plenty of free plug-ins are available from the Evidence Cleaner official website, which let Evidence Cleaner remove all activity from numerous applications.